Provolone Auricchio, coming from a century-old tradition, is proposed in three characteristic formats: Zuccotto, Affettato and Provolettone. 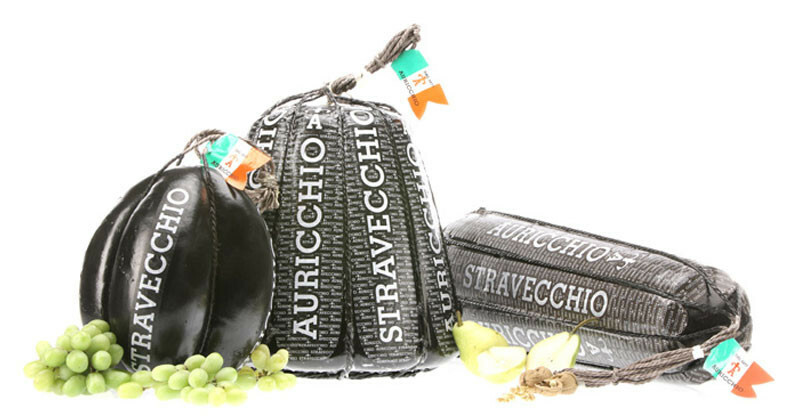 Auricchio Stravecchio is manufactured following the ancient dairy handicraft process which requires a very slow maturing in special rooms for over one year. The Stravecchio is easily recognizable from its brown-coloured surface and its peloure, a thin film of see-through paper with a white lacework pattern and the white brand Auricchio printed on it, which enhances the prestige and elegance of this true king of the table. It is an extra touch to your dishes. You can grate it on pasta or serve it in slices as a nice and quick appetizer. Look up in the Auricchio recipe book for new ideas: as a fantastic starter serve fingers with provola, oil and chives.